I love giving simple learning activities fun thees for the seasons or holidays. This Christmas color mixing is just that! So easy to set up and fun for kids to do. Learn through play and experimentation this holiday season with Christmas color mixing in plastic reusable ornaments! 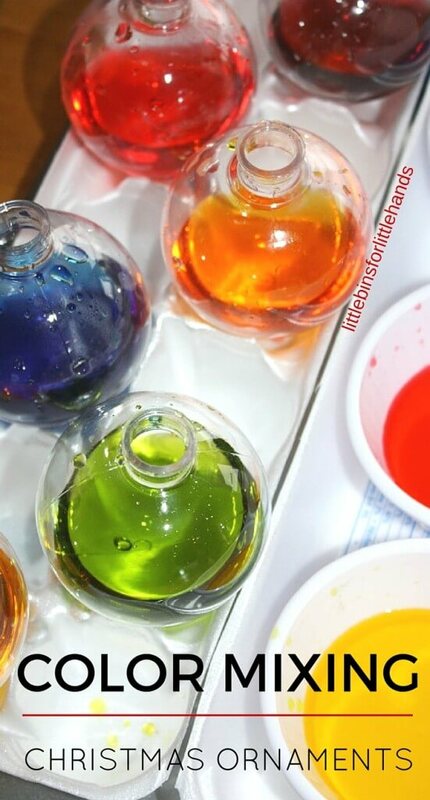 Our Christmas color mixing play is simple science and early learning fun! We are all about exploring Christmas sensory play activities this time of year and have done so many already! We love color mixing activities that use hands on play! 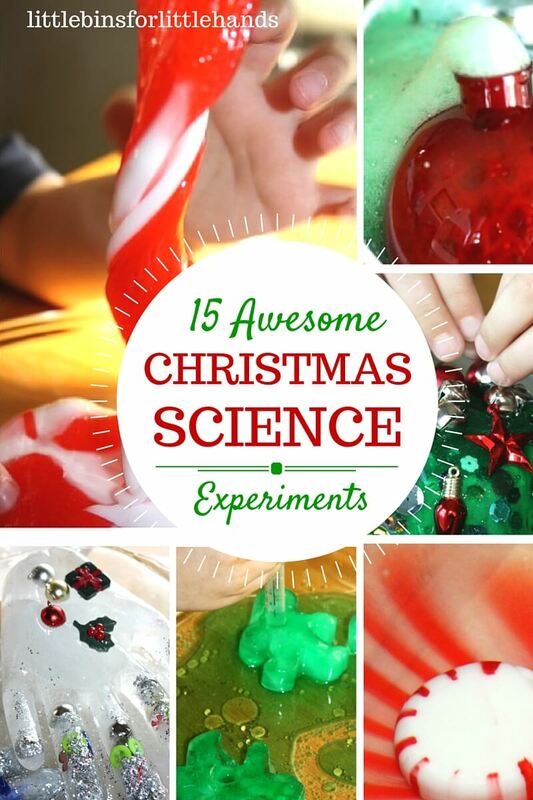 We have used these perfect plastic globe ornaments in a few ways already! We made erupting ornaments with baking soda and vinegar, a craft sand sensory bin with ornaments, actual tree ornaments, and slime ornament gifts. 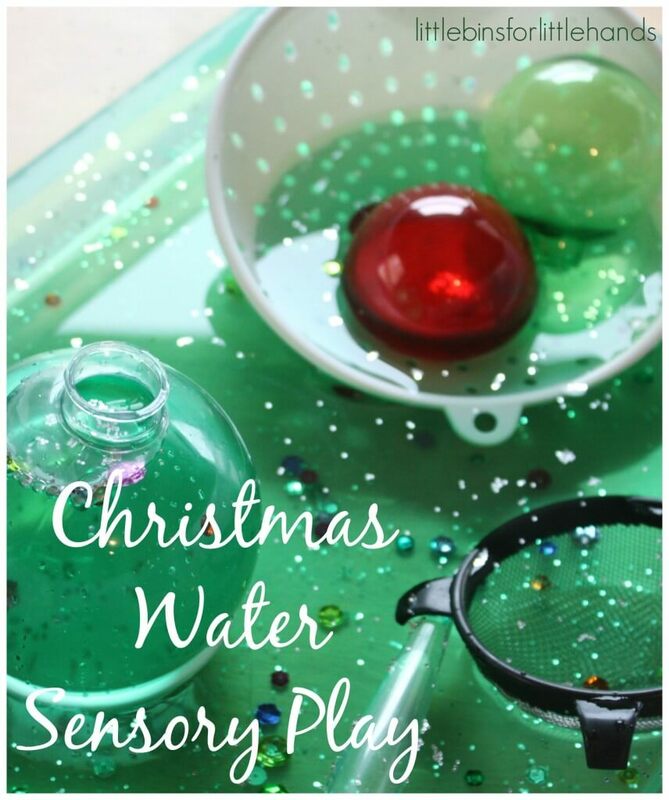 We just tried a Christmas water sensory play bin too! This Christmas color mixing activity is easy to set up for quick morning play and learning! 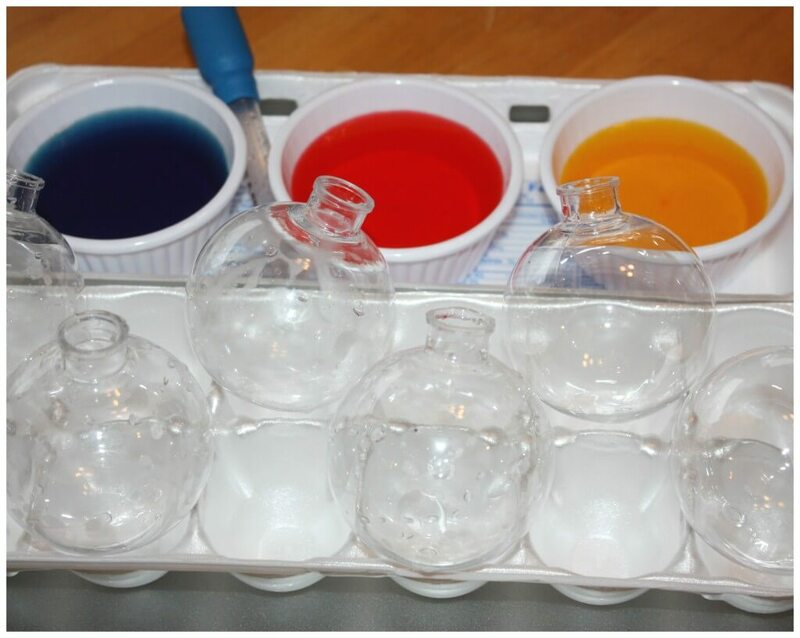 For this simple Christmas color mixing activity, I used 6 plastic globe ornaments with removable tops. I set them up in an egg carton so they wouldn’t roll around on us! We used three small plastic containers to hold our three primary colors: red, yellow, and blue. I set those in the back of the egg container. I placed everything on a cookie sheet and put out an eye dropper. Invitation for color mixing play! 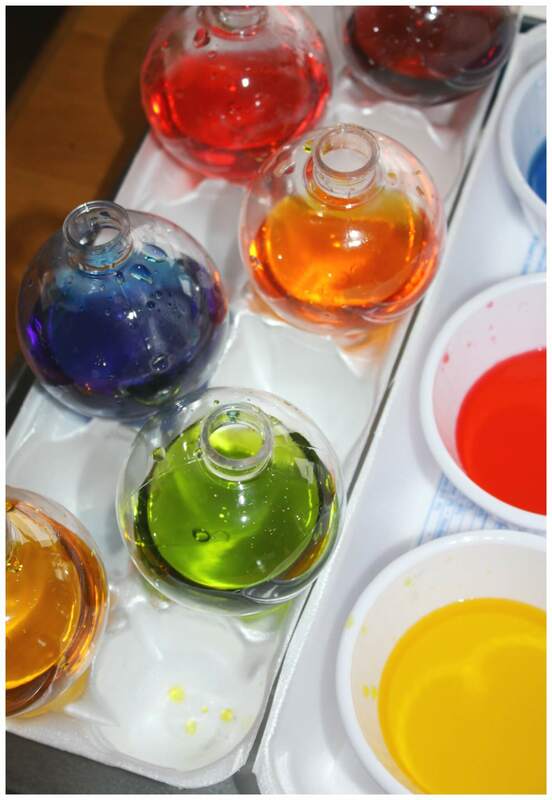 Invite your child to explore color mixing activities in fun, hands on ways that are sure to make them smile! I love mixing it up with the holidays or seasons to add a little variety! Not only does this Christmas color mixing activity show how colors mix, but it also uses great fine motor skills! Using the eye dropper and steadying the ornaments is big work for little hands! We mixed the traditional colors in the globe ornaments by first filling in our primary colors, red, yellow and blue. Next we chose two colors to combine and guessed the results! You can go even further and let your child explore dumping them into one another to make “new” colors. You may already know what happens when you combine too many colors, but let your child figure it out himself! Thats the wonder of childhood! Learning can be simple and fun and related to the season or holiday. Young kids love the novelty of it! Simple Christmas Color Mixing for play and learning. Do you happen to have a book or a place where I could purchase all these science experiments instead of trying to print off each one? through etsy or teacherpayteachers.com? My children will love this! Look for a book in 2018-2019!